So what’s up with the lack of updates? I find myself waking up every day, getting on the road and running across town and back to obtain random materials and parts… which end up not working for one reason or another. That’s just the way projects go I guess. July 1st marked one month since I was originally supposed to shove off on the Horizon Tour. Each day that goes by leaves me feeling more and more restless… and even useless. I wish I was better at fabrication, at wiring, at everything. If I were, I could help more in the projects instead of relying so much on others. I have so many amazing and talented people generously helping me make this dream road trip come true. 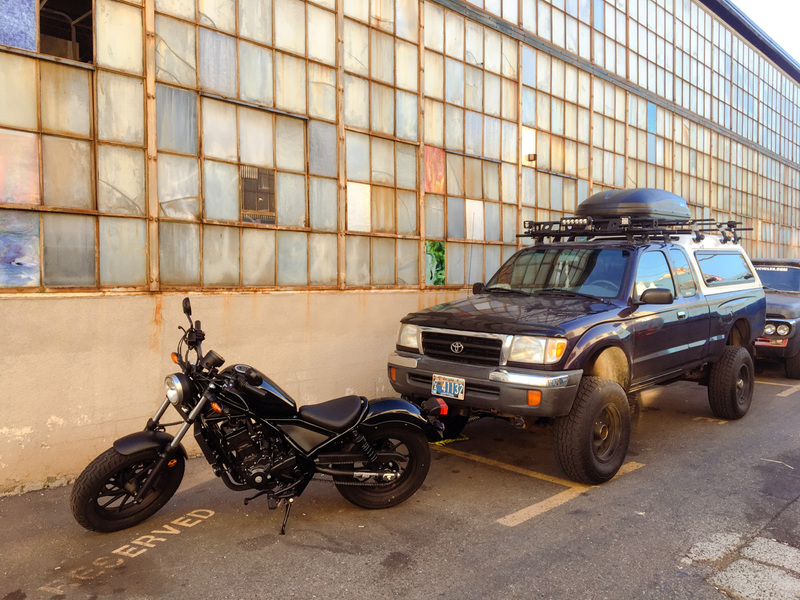 But even so, my only priority these past months has been to get my bike, truck, and self ready to hit the road. I have one thing on my mind right now… and that’s getting the hell out of dodge. Working around schedules on top of the actual time it takes to make all this stuff happen is just so much to deal with. I woke up on the first of the month and headed to the DEQ (Oregon state’s emission testing) with the Purple Prius Eater to run through and hopefully pass I can get new tags in October when mind expire. Instead, I got a big fat F. The issue, in summary, is an electronic problem with my Idle Air Control valve. 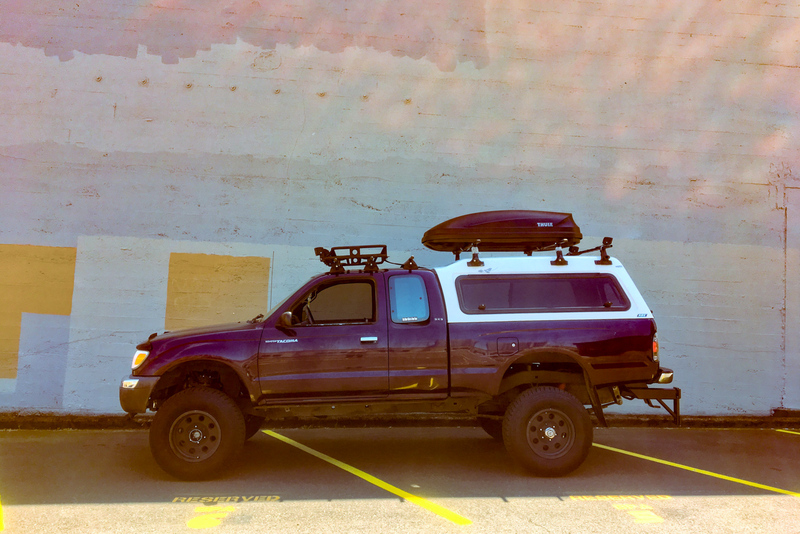 The deeper explanation: In September of last year, by friend Bill Scanlan (of Bill’s Old Fashioned Service in Oregon) was lured down to Southern California with promises of sunshine and tropical drinks (as well as cash money) to put a new engine into my 1998 Toyota Tacoma 4×4. We picked up the proper 3Rz engine from JDM Imports in LA. With just 45,000 miles, it was a better option for me than just parting ways with my beloved PPE and trying to buy another truck. The only real issue we (he) had with the whole transplant was an idle air control error popping the P0505 engine code and turning on my check engine light. It ran great and got better gas mileage than before (no surprise there with the shape of my previous engine). After my return to Portland, I brought the PPE to Bill’s shop in Lake Oswego. After a new IAC valve, the issue seemed to go away (check engine turned off). Unfortunately after a driving cycle it turned right back on again. Some fiddling and mechanic magic later, my rig was idling at the exact 600-750 rpm range, the light turned off again, but the code was still showing up when plugged into the computer. We had hopes that a few driving cycles would flush the system and let the computer reset and readjust. The check engine light stayed off for over 250 miles, so I figured “Yay! Problem solved!” But taking it through DEQ today showed me that no, something strange and electronic is going on. After my failed trip through testing I headed to Autozone for more Undercoat spraypaint to finish my front bumper and swap some tail light bulbs. I had picked up the proper #1156 bulbs because one of my back up lights went out, and it turned out one of the bulbs in the package was in fact not the correct bulb, nor the same as the other. They were out of the paint I needed, but I did get the right (and matching) bulbs, so I guess we can call that a win. So no, these past few days have not gone how I’ve wanted, and revealed a ton of extra work for me that I honestly don’t want to deal with amidst everything else. What many days these past few months have seemed like. At the end of the day, leaning on my elbow while writing this with old fashioned paper and pencil, I remind myself that it will all be worth the wait and the stress. After all–you can’t have rainbows without rain. What’s with the Name the Horizon Tour? Freelance journalist and founder of the MotoLady website.